It's less likely a healthy lunch will be tossed in favour of vending machine chips if the kids—big and small—get to plan alongside their parents, says a University of Alberta nutrition expert. And, added Sabina Valentine, it's a great way to slip in a lesson about lifelong eating habits. "Whatever their age, really involve them in the process and empower them to make the decisions," said Valentine, a registered dietitian with the Faculty of Agricultural, Life & Environmental Sciences. "It can be easy to get into power struggles about food, but we can't make it a control issue." Along the way, parents can pass along decision-making tools, like using the 80/20 rule—eating healthy 80 per cent of the time and indulging the other 20 per cent. "You're laying the groundwork for eating habits for the rest of their lives. It's hard to learn as an adult, but if you learn it as a youngster, weight management and healthy eating become easier as an adult," she said. For youngsters, set some limits but guide them to healthy choices, like letting them pick one item from each of the food groups to pack for lunch. "That way, they feel like they've made the choice." Feeding teens, however, is a different challenge. "They are more independent so they're making food choices on their own, and they're also being influenced by their peers. They're trying to figure out what they should eat," she said. To get them wanting homemade lunches instead of cafeteria fries, include older children in planning and grocery shopping for the week. Not only do they get a say in what they want, but they're also learning how to shop when they eventually leave home. "You're really giving them the skills for preparation for when they are on their own. It's a chance to show them how to budget and read food labels," Valentine explained. Parents can also set an example by packing healthy lunches for themselves and encouraging sit-down meals for the family. "The emphasis isn't so much on the amount you are eating, it's about the experience and joy of eating with friends and family." And if an uneaten lunch does come home, parents shouldn't see it as a waste, she said. "It's a good opportunity to communicate and change things. 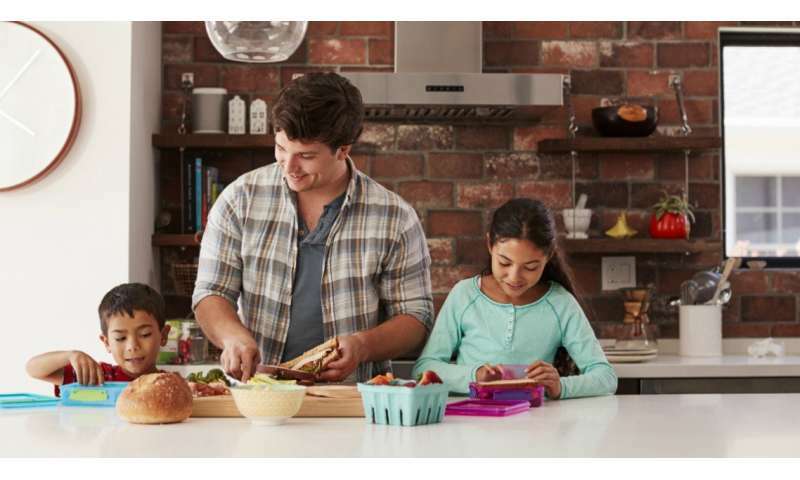 Talk to your kids about what you can do to make sure they get healthy foods in their lunch." Four elements should go into any lunch box, Valentine said: variety, moderation, balance and options. The choices are almost endless: hummus or salsa with veggie sticks, whole-grain crackers and cheese, grapes, souvlaki, apple slices with cinnamon sprinkles, sliced hard-boiled eggs, watermelon sticks, even whole-grain homemade mini-muffins or banana bread. Fun-shaped cookie-cutter sandwiches are also popular, and don't have to be all about white bread. "Try whole-grain bread, tortilla or pita shells with tuna, salmon or egg salad," said Valentine. Even leftover dinner and breakfast foods like whole-grain French toast or waffle strips with yogurt dip make tasty, fun lunches. It's OK to indulge by occasionally packing a less nutritious treat like a granola bar or a home-baked cookie as long as it makes up no more than 20 per cent of the meal, said Valentine. Children and teens need a diet fortified with important nutrients like iron for retinal and brain development and calcium for bone growth, so pack items from each of the food groups outlined in Canada's Food Guide: fruit and vegetables, grain products, milk or milk products, and meat or alternatives. And don't forget snacks, said Valentine, who suggested a handful of grapes or a half-cup of yogurt for younger kids. "They have small tummies and high nutrient needs, so they should have snacks throughout the day. It doesn't have to be huge—just enough to keep them going," she said. Good grab-and-go power snacks, especially around exam time for older kids, include pairings like string cheese and a handful of almonds, soft pretzels and hummus, peanut butter and an apple, or popcorn mixed with nuts and dried fruit. To avoid food fatigue, "Give kids a couple of options when serving a snack or lunch as well as when planning meals," suggested Valentine. "Offer two types of veggies, like carrots and broccoli, versus one, to make it more interesting."